« Download the Otaku no Podcast app and you could win a $10,000 iTunes gift card! I have a love-hate relationship with computer speakers. I’ve owned many pairs over the years, but never really liked any of them. Either they sound mushy or flat (or just generally “off”), have either too much (or too little) bass, or they distort when you crank up the volume (I’m not even talking super loud, just moderately loud), or they just don’t sound “right” in general. So yeah, I guess that would make it more of a hate-hate relationship then. Every once in a while I decide to roll the dice and try another pair, and almost always I end up disappointed, not to mention somewhat lighter in wallet. 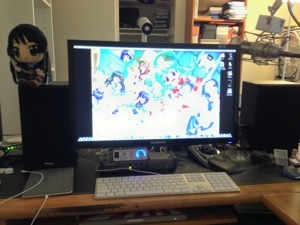 And for me, good computer audio is important, since I do a lot of TV/movie (and anime) watching on the computer. That is why when, on a recent episode of Tekzilla when host Patrick Norton reviewed the Lepai LP-2020A+ Tripath Class-T Hi-Fi Audio Mini Amplifier with Power Supply and the Dayton Audio B652 6-1/2-Inch 2-Way Bookshelf Speakers, my ears perked up (no pun intended). (The review starts in at 04:56) Here is a reasonably priced (around $75 total) amplifier and speaker package that supposedly boasts amazing audio quality (especially when you consider the price) and is suitable for almost any application, including being used as computer speakers. Well I just couldn’t pass that up. If Patrick Norton, noted audiophile and alpha geek, likes them, then they must be good, right? In a word, yes. In two words, Hell Yeah. The Lepai amp, although inexpensive, doesn’t look it. It’s constructed of metal and has a very solid feel to it. The knobs all turn smoothly, and there is even a cool blue LED illuminating the volume knob. The audio is crisp and clean, and the unit also has bass and treble adjustments. (It can also, at the push of a button, just play the audio straight, without any enhancements.) And even when I cranked it up to 11, I did not notice any distortion. (Sadly the volume dial doesn’t literally go up to 11. I so wish manufacturers would do that.) And the box runs nice and cool, and is small enough to fit on even my crowded messy desk. Plus, if you’re a hardware hacker, there is quite a large modding community around this amp. Unfortunately by the time I was ready to pull the trigger and order, the Dayton speakers were out of stock. So I have no way of testing those. However by all accounts the speakers sound amazing. Instead, I rummaged through the garage and came up with a pair of crappy old Sony speakers from a long-dead stereo system. Which, when paired with this amp, sound incredible. So if you do any music listening/video watching on your computer and/or good computer audio is important to you, definitely check this out. The Lepai amp is a no-brainer; just get it. Unfortunately the Dayton speakers are still out of stock as I write this, but almost any other pair of bookshelf speakers will work (you might even have some kicking around in the garage like I did). Do yourself (and your ears) a favor and check these out.